Acer has launched a new dual SIM smartphone called the Acer Liquid E2. The smartphone targeted towards the European markets has a marked performance due to its quad core processor. The Acer Liquid E2 has a 4.5 inch IPS display. The device is powered by a quad core 1.2 GHz ARM Cortex A7 processor with 1 GB of RAM and 4 GB of internal storage. The device also has a PowerVR SGX544MP GPU. The internal memory can be extended with microSD card slot. 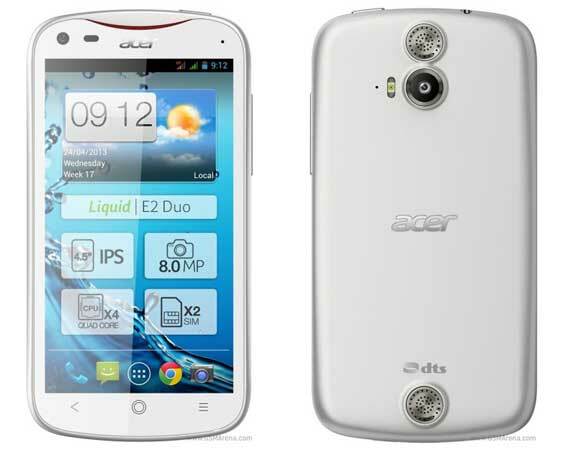 The Acer Liquid E2 is equipped with two cameras, an 8 MP primary camera and a 2 MP front facing camera. The smartphone runs on the latest Android Jelly Bean OS. The device packs in a powerful 2000 mAh battery.